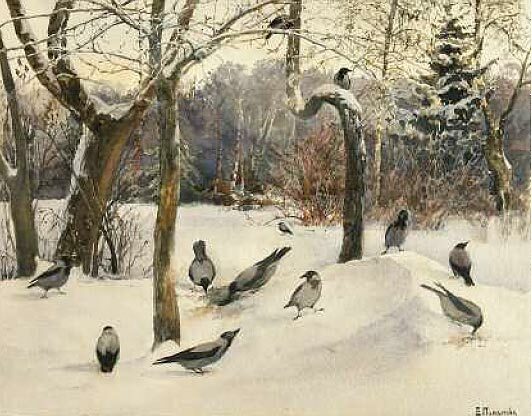 Among the museums that loaned Polenova’s work from their collections to the exhibition were the Polenov Memorial History, Art and Nature Museum Reserve, and the Memorial Art and Literature Museum Reserve at Abramtsevo (most of the artist’s work is in the collections of these institutions); the Russian Museum, Historical Museum, All-Russian Decorative Art Museum, Literature Museum, Historical, Architectural, and the Art and Nature Museum Reserve at Tsaritsyno also contributed work. The exhibition at the Tretyakov Gallery was the first where Polenova’s graphics were shown almost in their entirety. Yelena Polenova was one of the pioneers of the national-romantic movement in Russian modern art and of the beginnings of symbolism. As an active member of the Mamontov circle of artists, she was among the founders of the museum of folk art at Abramtsevo, as well as the ceramics, woodwork and carving workshops there. Polenova was one of the first artists to turn to book illustrations — over a relatively short period of time, from the end of the 1880s to the 1890s, she created illustrations for and adapted more than 20 collections of Russian folk fairy tales and proverbs. 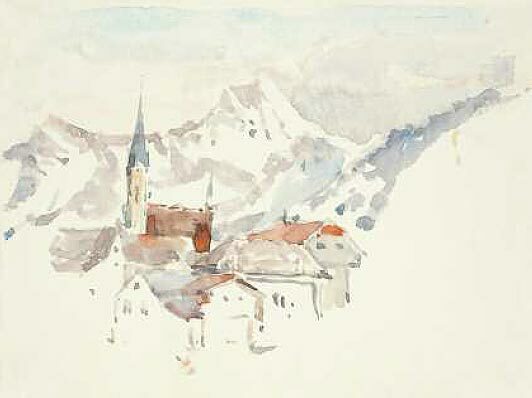 The artist’s contemporaries thought that her work in watercolour was her strongest, and in this genre she remains unsurpassed. 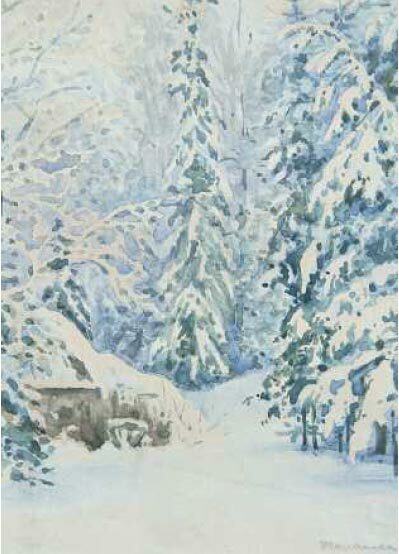 During her later years, she turned to oil painting and showed her work at the “Peredvizhniki” (Wanderers) group exhibitions; however, her watercolours remain her best achievement. She painted landscapes and the so-called “flower portraits”, illustrations to Russian fairy tales and exquisite ornamental patterns, and created designs for furniture and wooden household objects. The challenges of exhibiting watercolour paintings and the special requirements for light and micro-climate conditions in storing them explains why there are almost none of Polenova’s watercolours on display in Russian museums. 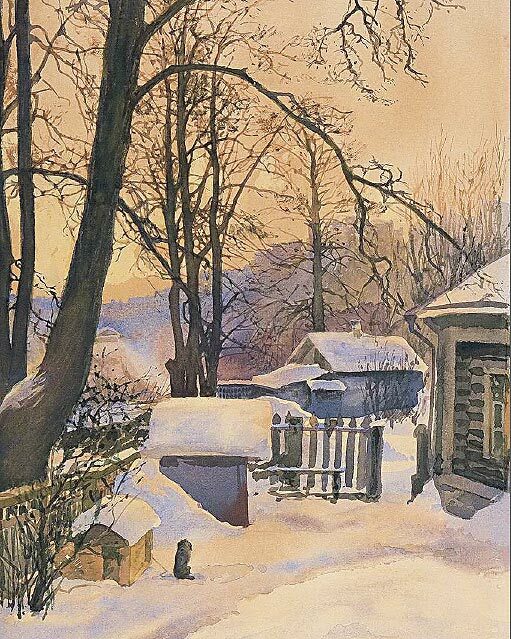 Thus, her oeuvre, so highly praised by Vladimir Stasov, Alexander Benois, Sergei Diaghilev, Sergei Makovsky, Pavel Chistiakov, and Ilya Repin, remains largely unknown to the general public. Even though Polenova soon had to leave the society due to disagreements with its leadership, she remained as the head of its Folk Art and Historical Exhibitions department, which had been created on her initiative. Not only did she develop its programme and select its participants, she also painted three pieces for it — “ Berendei Celebrating Shrovetide (Shrovetide in the Wooden City)” (1895, in the Tretyakov Gallery), “The Appearance of Boris and Gleb to the Warriors of Alexander Nevsky” (1895-1896, Orel Regional Museum of Fine Arts) and “Prince Boris Before He Was Slaughtered” (1896, in the Russian Museum). 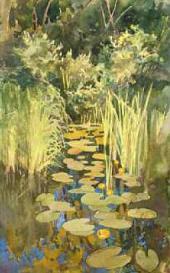 The first of these paintings was shown at the exhibition. Judging by its catalogue, the posthumous exhibition of Polenova’s work was substantial and comprehensive. It opened in St. Petersburg on January 15 1902 in the halls of the Academy of Arts and remained open to the public until January 10 1903. 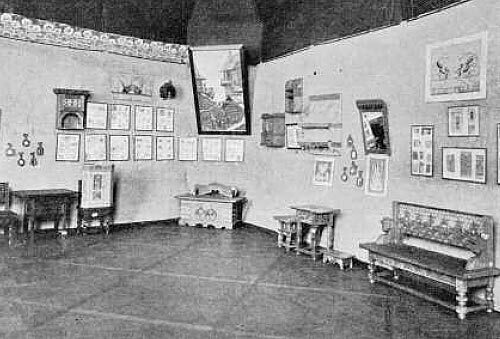 Sergei Diaghilev wrote an enthusiastic review in the “Mir Isskusstva” (World of Art) magazine, where he pointed out that the exhibition “was arranged with a great deal of taste”4; he also mentioned that at the beginning of 1903, the exhibition moved to Moscow, to the Imperial Historical Museum. A detailed article about it, completed with photographic illustrations, was published in “Niva” (Field) magazine. Some of the pieces shown at the posthumous exhibition, as we can see from the photographs, were in museum collections and are on display at the recent exhibition, including a bench (end of the 19th century) and small table for needlework from the Abramtsevo Museum Reserve. Currently, most of Polenova’s work from the private collections of the Polenovs and the Mamontovs is housed respectively at the Polenov Museum Reserve and the Abramtsevo Museum Reserve. 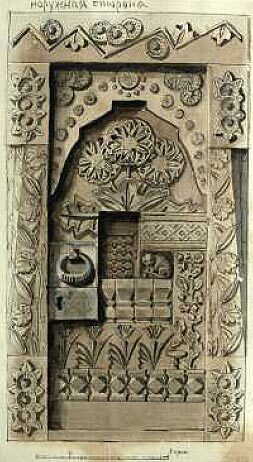 The latter has a large number of ornament drawings, which were apparently turned over to Mamontov’s descendants by Maria Yakunchikova before she left Russia6. 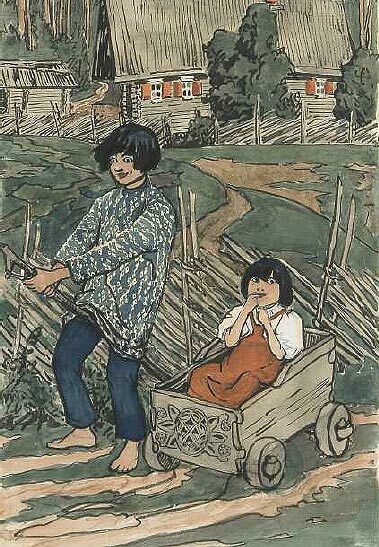 Her illustrations for Russian folk tales, which belonged to Maria Tenischeva, as well as the lovely watercolours from the collections of Alexandra and Sergei Botkin, found a home at the Russian Museum. A wonderful series of watercolour landscapes which the artist painted during a trip along the Volga and the Don rivers, to the Caucasus and Crimea, and gifted to Praskovia Antipova, is now housed at the Yaroslavl Museum of Fine Arts. 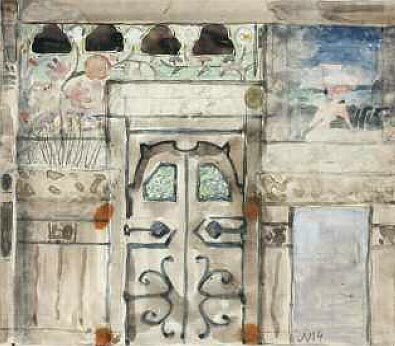 A significant number of Polenova’s architectural sketches are at the Historical Museum; this collection also includes her working materials, such as rubbings from carved objects of folk art, which were gifted to the museum by Vasily Polenov in 1921. Only a small number of the above-mentioned works became part of the exhibition — the rest were reproduced in the catalogue prepared specifically for this project. Reproductions of Polenova’s work from the museums of Kaluga, Kostroma, Nizhny Novgorod, Astrakhan, Saratov, Ufa, Orel, Kursk, Chelyabinsk, Alupka and Ivanovo were included in this album. Apart from numerous illustrations, the publication has many articles which give detailed information about the artist’s creative path, her characteristic style, as well as her place in Russian artistic life at the end of the 19th and beginning of the 20th century. 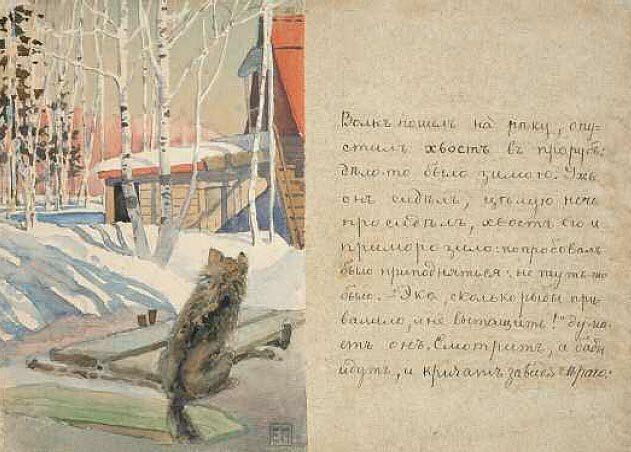 Archival publications form an especially interesting section, as the artist’s previously unpublished correspondence and reminiscences of her contemporaries from the Manuscripts Department of the Tretyakov Gallery are included. All expert articles are abundantly illustrated with photographs, most of which are published for the first time. Yelena Polenova was born in St. Petersburg, into the family of an hereditary nobleman Dmitry Polenov and his wife Maria. Yelena’s personality was very much influenced by the artistic atmosphere of her family. The future artist’s father, a renowned archaeologist, bibliographer, historian, and the author of many publications on ancient Russian manuscripts and the history of Russian law, was able to interest his daughter in world history. Later it allowed her to successfully pass the examination to receive the diploma of a teacher of history. Ydena’s mother, the granddaughter of Nikolai Lvov, a famous architect at the time of Catherine II, was gifted in literature and art. When she noticed that her younger daughter had an aptitude for drawing, she began to practice with her, and later hired a tutor, Pavel Chistyakov, who was to become famous as a teacher of art. From the age of nine, along with her other siblings, Yelena took drawing classes from him. 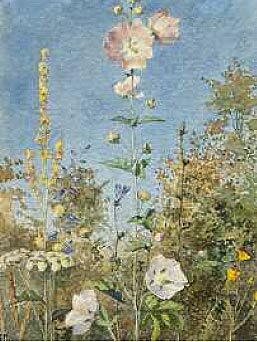 From that time through to 1880, with small breaks, she studied drawing and watercolour at his studio. It was only while Chistyakov was living abroad (on a scholarship) that she attended Ivan Kramskoi’s classes at the drawing school at the Society for the Support of Artists. Grigorovich’s plans for a teaching career for Polenova were not to materialise fully. Polenova taught porcelain and earthenware painting in a Maiolica class she had created only for a short period. In the autumn of 1882, after the death of her father and sister, Yelena and her mother had to move to Moscow to live with her brother Vasily, who had settled there previously. Soon she became an active member of the Mamontov artistic circle, taking part in designing decorations for home theatrical productions, and later creating costumes for performances of Mamontov’s “Private Opera House” in 1885. Polenova’s porcelain is preserved at the Polenov Museum Reserve and at the Historical Museum. A series of small plates titled “The Four Seasons” (from the 1880s, in the Polenov museum) is especially interesting — each month of the year is represented with a typical landscape. At the end of 1882, at the All-Russian Industrial and Art Exhibition in Moscow Yelena Polenova was awarded a bronze medal for painting on porcelain and earthenware. It was not without her influence that in 1890 a pottery workshop, Mamontov’s pet project, was established in Abramtsevo. In the same year, a woodwork and carving workshop was set up on Mamontov’s estate to teach local boys the craft. “One had to hear the delight in Yelena Dmitrievna’s voice when she spoke about the successes of Abramtsevo’s apprentices, as well as the distribution of their work through sales, to understand how passionate she was about her beloved work. It was not just an artist’s satisfaction upon creating beautiful images, but also the need to bring those images to life, to ‘give them out’ to the people,11 the artist Yekaterina Junge would later write. Yelena Polenova’s creative life was quite intense at this time, as witnessed by many of her letters: “My work day is separated into morning and afternoon activities. In the morning I work on my oil painting... Fairy tales are part of my morning, too. I take care of the workshop business in the afternoon. I work on the creative issues in the evenings, and the administrative side at dusk; once a week I go to Abramtsevo.”16 Apart from all this, she hosted her “ceramics Thursdays”, which were attended by numerous young artists, and attended Saturday watercolour classes at the Moscow School of Painting, Sculpture and Architecture. The mid-1880s were the time when Polenova’s art grew independent and mature. It was then that she challenged herself to a task quite elusive for the visual arts — “in a series of watercolours, to convey the Russian people’s poetic view of Russian nature, to determine for both myself and others how Russian landscape influenced and found expression in Russian folk poetry, both epic and lyrical.”17 She successfully fulfilled this task in a series of illustrations to Russian fairy tales. The artist’s interest in folklore and folk culture in general developed from her grandmother’s influence: Vera Voeikova18 had a vast knowledge of Russian history, folk poetry and fairy tales. 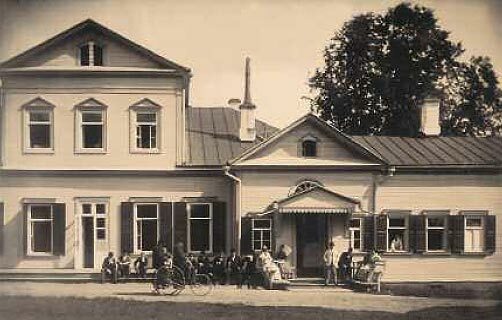 Sometimes in the summer Voeikova took Ydena and her other granddaughter Olga to her country estate in Olshanka in the Tambov region. Later the artist often recalled the long carriage rides, when she admired the beautiful landscapes and listened to her grandmother’s rendition of the folk tale “War of the Mushrooms”. This fairy tale became the first one that Polenova illustrated and published as a phototype edition in 1889 at the publishing house of Thiele. She personally created the layout, ornamental decorative inserts, and the script. Polenova painted her illustrations for “War of the Mushrooms” in a realist style (in the tradition of genre painting), like her other illustrations of the Abramtsevo period 1886 to 1889, for the fairy tales “Ded Moroz” (Father Frost), “The Wolf and the Fox”, “Ivanushka the Fool”, “Izbushka na Kuriikh Nozhkakh” (Cabin on Chicken Legs). 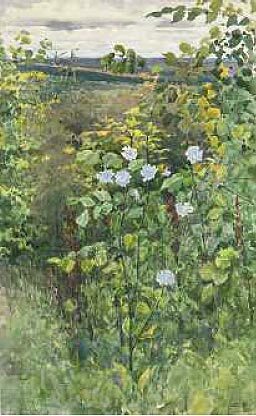 These stories usually develop against the background of the distinctive land scapes of Abramtsevo and its surroundings. The wooded road up to the Khotkovsky monastery — Polenova painted it from the veranda of the house in Abramtsevo — became the setting for her last composition for “War of the Mushrooms”: the milk-caps, their rifles drawn, are starting on their campaign. Numerous pages of the artist’s album preserved her watercolour sketches of honey fungus, red-pine mushrooms, bearded milk-caps, death caps, edges and clearings in the woods, painted both close up and from a distance. The mysterious garden and pond of the Tolstoy family house in Bozhedomka in Moscow, where the Polenovs lived at the beginning of the 1880s, inspired the illustrations for the fairy tale “The White Duck”. The scenery, the ducks swimming in the pond, and even Vasily Polenov’s infant first son Fedya (he was painted sitting in a nest) all served as “models” for the illustrations. The background landscape carried considerable meaning in this work; the artist aspired to find motifs that would help fully express strong poetic feelings. Polenova wanted to see her books published and affordable for the widest segment of the population, and unlike “War of the Mushrooms”, with colour illustrations; to achieve that, she drastically changed her painting style. 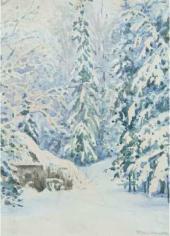 The “Kostroma” series is stylistically different from the illustrations created previously in Abramtsevo. It is executed in a typically modernist manner, with strong emphasis on clear lines, bright spots of colour, and expressive silhouette. A sharpness and definition in the stylized drawing and application of local colour was achieved, which allowed for preserving a good quality of the reproduction in print. However, the fairy tales which were prepared for publication at that time (“Son Philipko”, “How the Bear Lost His Tail”, “Chiki-chikalochki”, “The Thieving Magpie”, “Nikolashka-Trebukhashka”, “The Fool and the Foolish Girl”, “The Greedy Man” and others) were only published after Polenova’s death in 1906 under the title “Russian Folk Tales and Rhymes. Surrounded by such gifted young artists, Polenova turned to oil painting herself. She first painted small genre scenes, and then gradually moved on to more challenging allegorical, symbolic work. “I am working on a painting inspired by Fofanov’s poem ‘Bright Stars’,” she wrote to Yelizaveta Mamontova. 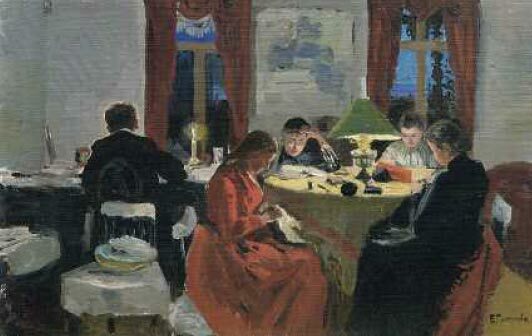 “Therefore, I have to paint the night, the stars, the night air and light, the night colours — in short, all the lovely poetry of a summer night.”23 During the “Zhukovka” period, Polenova and Yakunchikova developed a strong spiritual bond which filled their lives with warmth and helped them creatively. Maria Yakunchikova, who for health reasons moved to Europe in 1889, felt an intense need to be in contact with Polenova. She constantly wrote to her, shared her artistic plans, and brought her up to date with news from Europe; sometimes she sent her catalogues from exhibitions of artists of the symbolist movement whose aim was to introduce “an element of mysticism into art”. In turn, Polenova stayed with her on her long trips to Paris. Thanks to Polenova Maria became seriously interested in folk art. 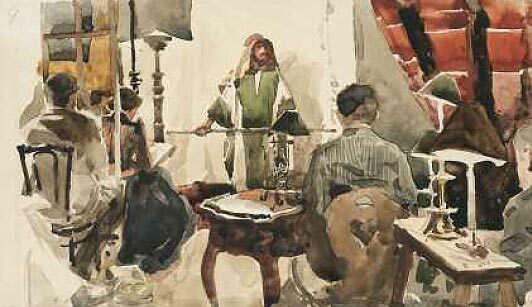 In Maria’s studio, they talked at length about their plans to take part together in the 1900 World Exhibition in Paris. 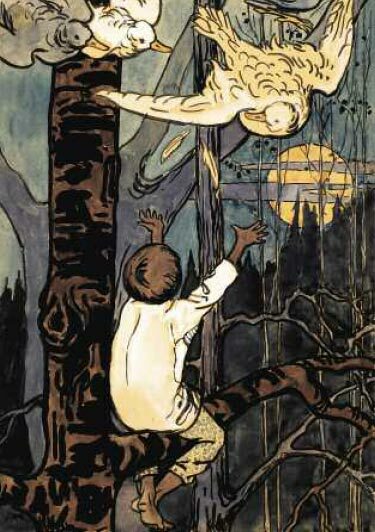 After Polenova’s death, Maria came to Moscow and created sketches for an open-shelf cabinet for the Russian Artisan Division and “The Girl and the Forest Spirit”, an embroidered panel (now in a private collection, Switzerland). She oversaw its embroidering, as well as that of Polenova’s “Ivanushka-the-fool and the Firebird” while living in M.F. Yakunchikova’s house on the Nara river. PasternakL.O. On the “Russian Artists’ Society”. Quote from “Zapiski raznyh let” (Notes from various years). Moscow, 1975, p. 215. Junge, E.F. Remembering Ye.D. Polenova. “Russkaya Starina” [Russian Antiquity], 1912. Volume 1. VI . P. 532. Further: Junge, E.F.
Letter from Ye.D. Polenova to N.V. Polenova. February 4, 1895. Sakharova, Ye. V. “Vasily Dmitrievich Polenov. Yelena Dmitrievna Polenova. A chronicle of the artists’ lives.” 1964. Moscow, Leningrad, p. 521. Further: Sakharova, Ye.V. 1964. Letter from N.V Polenova to A.P. Botkina. Moscow. November 27, 1902. Manuscripts Department, State Tretyakov Gallery. F. 48, item 760, sheet 1. While preparing the exhibition, we were unfortunately unable to locate the numerous pieces of embroidery which had been crafted to Polenova’s designs in the workshop of the village of Solomenki (in the Tambov region); the workshop was set up by Maria Yakunchikova in 1891, during the countrywide famine due to crop failure. Letter from E.D Polenova to D.Y Grigorovich. Paris. October 2/14, 1880. Manuscripts Department, State Russian Museum. F. 71, item 69, sheets 1-2. Kisselev, M.F. Memoir of E.Y Sakharova. “Povest’ mojei zhizni” [My life’s story]. “Pamiatniki kultiry. Novije otkritija” [Cultural heritage. New findings] Annual publication. 2001. Compiled by T.B. Kniazevskaya. Moscow, 2002, p. 38. Further: Kisselev, M.F. “Art and art industry”, 1899. #13, p. 36. Letter from YD. Polenova to YV. Stasov. Moscow, November1, 1894. Sakharova, Ye.V. 1964, p. 508. 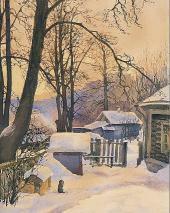 Polenova, N. V. “Abramtsevo”. Moscow, 1922, pp. 56-58. Letter from YV Stasov to E.D. Polenova. St. Petersburg, October 24, 1894. Sakharova, Ye.V. 1964, p.507. Letter from E.D. Polenova to P.D. Antipova. [Moscow] December 11, 1888. Sakharova, Ye.V. 1964, p. 405. Letter from E.D. Polenova to P.D. Antipova. [Moscow] October 25, 1886. Sakharova, Ye.V. 1964, p. 373. Vera Voiekova, after the death of her mother Maria Lvova (nee Diakova, 1755-1807), was raised by Gavriil Derzhavin’s second wife, Darya Derzhavina (1766-1842). Sakharova Ye.V., 1964, p. 774. Letter from YS. Mamontov to I.S. Ostroukhov. Abramtsevo. Dated August 3, 1887. Manuscripts Department, State Tretyakov Gallery. F. 10, item 1991, sheet 2. Letter from E.D. Polenova to E.G. Mamontova. [Nelshevka]. August 4, 1889. Sakharova, Ye.V., 1964, p. 433. Tatevosian, E.M. “Remembering E.D. Polenova”. Manuscripts Department, State Tretyakov Gallery. F. 54, item 12550, sheet 35. 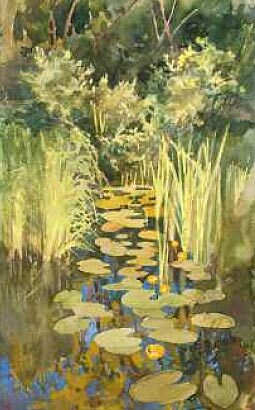 Benois, A.N. “Russkaja shkola zhivopisi” [Russian school of painting]. Moscow, 1997, p. 106-107. 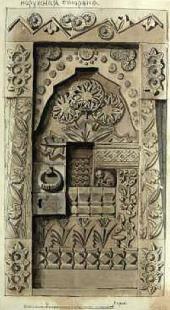 Sketch for the exterior of the “Skazochnaya” [Fairy tale] door for the carpentry workshop in Abramtsevo. 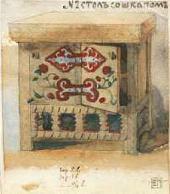 Sketch for the interior of the “Skazochnaya” [Fairy tale] door for the carpentry workshop in Abramtsevo. 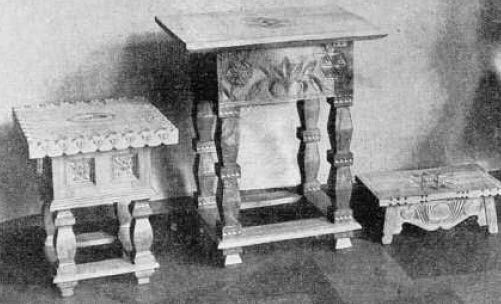 Sketch of a table (“Table with cabinet”) for the carpentry workshop in Abramtsevo.